Small Mod that allows you to sostrituire your standard menu with a tab menu is very simple, and above all very discreet on file icy, in fact the changes are relatively few. * If you use UPI2DB Mod on active or selected by user, you must delete the word "Messages" from on lang_main_upi2db.php for obvious reasons of space. 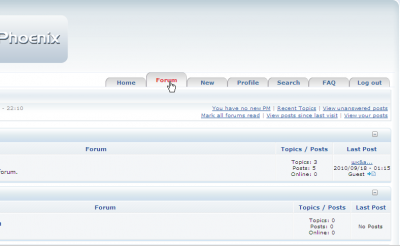 But how about trying to add some php code to the default header to make the menu "Location-Smart" so that the buttons stay changed when at a specific location like "viewtopic.php" rather than just a mouseover change - Just like in your picture, the "Forum" button would stay up while one is at that location? Would possibly save a lot of editing for each template set? In current development version I have added some vars which should easily allow doing that. This is the main var used for that... which could be used to match the current page without having to insert extra PHP code. Create the css class .selected and let the css do the work. TopoMotoV3X has no doubt spent some time with this, so maybe he would like to take it a bit further? Well... I have created that var just to avoid using PHP code in TPL (this also mean some small speed-up). Menus are a cow of a thing, but try to get your mind on this as another way of simplifying it. So the menu looks something like this. So if one adds anything else (as below) to the "Menu" it will automatically parse the variable. I'm not really sure as to how this is put together with some other software I use - But it sure is easy to add new "Locations" automatically to the menus, and I'll dig it out if you want to have a look at it - - or tell you where you can get it. This function depend on the MODE var, but you can easily replace that with script name. looks like, we can also try to archive to get the data from dyn menu table. working on a mod to create the top menu through dyn menu , adding a new script to take the Cat string out of the menu array. Idea is, when you create a new Dyn_Menu in CMS,you got an selector to choose between header menu or nav menu block on the right. This menu has a problem with languages because it used "Fixed width" tabs. The only real way to overcome it is to use at least three images per tab (background, left and right) so that it automatically expands to different length words. The Tab Menu pic shows what I mean. The Tab Menu2 pic shows one alternative that wraps the words regardless of length, but it has a drawback - Unread Posts use VARIABLES, and one cannot wrap variables because there is no place to slot the code in where it has to go. And no, I don't want to hijack this thread by discussing Tab Menu2 or other ways to maybe do it - That's for another thread. Yep, I said that badly - The background is to fill the space for the whole width of the menu, unless one uses the default .css for the menu background. I need to to make more time available to myself. i think, you should use the custom background of the template all time. No, that wasn't the point I was making - If you look at the German word for "register" in "your" tabs in the picture, it's right to the edges of the tab. They use a lot of longer words than that (I don't think there are any short ones - Easy TheSteffen ), and that may create problems with the layout because the tabs are limited in width.